The General Electric J47 turbojet (GE company designation TG-190) was developed by General Electric from its earlier J35. It first flew in May 1948. The J47 was the first axial-flow turbojet approved for commercial use in the United States. It was used in many types of aircraft, and more than 30,000 were manufactured before production ceased in 1956. It saw continued service in the US military until 1978. Packard built 3,025 of the engines under license. The J47 design used experience from the TG-180/J35 engine which was described by Flight magazine in 1948 as the most widely used American-conceived turbojet. Overhaul life for the J47 ranged from 15 hours (in 1948) to a theoretical 1,200 hours (625 achievable in practice) in 1956. For example, the J47-GE-23 was rated to run 225 hours time between overhauls. As installed on the F-86F, it experienced one in-flight shutdown every 33,000 hours in 1955 and 1956. 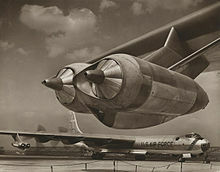 (TG190-E) Production by Studebaker Corp.
Two J47 turbojet engines were mounted outboard of the three Pratt & Whitney R-4360 Wasp Major piston engines on each wing of the B-36. In the 1950s, interest in the development of nuclear-powered aircraft led GE to experiment with two nuclear-powered gas turbine designs, one based on the J47, and another new and much larger engine called the X211. The design based on the J47 became the X39 program. This system consisted of two modified J47 engines which, instead of combusting jet fuel, received their heated, compressed air from a heat exchanger that was part of the Heat Transfer Reactor Experiment (HTRE) reactor. The X-39 was successfully operated in conjunction with three different reactors, the HTRE-1, HTRE-2 and HTRE-3. Had the program not been cancelled, these engines would have been used to power the proposed Convair X-6. ^ 1956 | 0590 | Flight Archive. Flightglobal.com. Retrieved on 2013-08-16. ^ a b c d e f g h i j k Bridgman, Leonard (1955). Jane's all the World's Aircraft 1955-56. London: Jane's all the World's Aircraft Publishing Co. Ltd.
^ Thornton, G; Blumbeg, B. (January 1961). "Aircraft Nuclear Propulsion Heat Transfer Reactor Experiments Fulfill Test Goals". Nucleonics. McGraw-Hill. 19 (1). ISSN 0096-6207. Kay, Anthony L. (2007). Turbojet History and Development 1930-1960 Volume 2:USSR, USA, Japan, France, Canada, Sweden, Switzerland, Italy and Hungary (1st ed.). Ramsbury: The Crowood Press. ISBN 978-1861269393. Wikimedia Commons has media related to General Electric J47.